The app first performs boolean operations (specifically - union & subtraction) on polygons and draws the resultant path on .dxf file. So the curved portion of the path is composed of tiny segments, which is a big problem for the CAM software that'd be used later. 1) How can I convert those tiny line segments to circles/arcs using the list of points? 2) Can I take a completely different approach to avoid this problem? I don't know how the clipping library you are using returns the clipped objects, but if I understand your question, you want a way to represent your circles that does not use much memory? If you are only using perfect circles (and not ellipses) you could represent each arc segment as simply an origin point, a radius, and a start/stop angle. This is the part where it would be helpful to know what the clipping library returns. If it returns a chain of points as a separate object for each clipped arc segment, and you already know the radius and center of the circle (from before clipping), you could take the first and last point in the returned chain and compute the angle for each. Then when you would like to draw the thing, you can write and algorithm to trace the arc going from the start to stop angle. 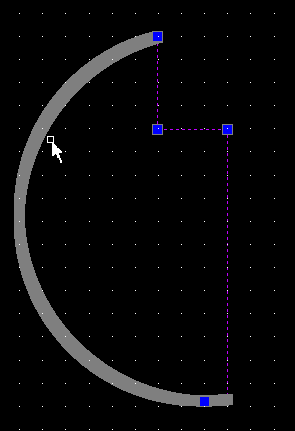 If you want to do further clipping, you could recreate the arc as a chain of points. Be careful about whether the returned segment was clockwise or counterclockwise. You cannot use Clipper and expect analytical results. Circle arcs will be composed by line segments. That said, you know your boolean operands so it should be possible and fairly easy to map all line segments back to their origin operand and extract the arcs yourself. Not the answer you're looking for? Browse other questions tagged polygon clipping cad or ask your own question.